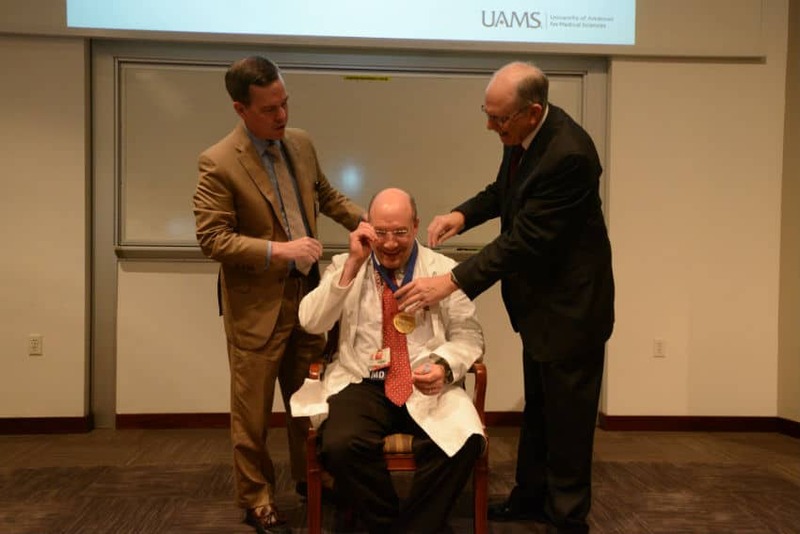 Seth Berney, M.D., receives his commemorative medallion from Chancellor Cam Patterson, M.D., MBA, and College of Medicine Dean Christopher T. Westfall, M.D. Sept. 28, 2018 | Seth Berney, M.D., chief of the Division of Rheumatology in the College of Medicine at the University of Arkansas for Medical Sciences (UAMS), was invested Sept. 25 as the inaugural professor of the Eleanor A. Lipsmeyer Professorship in Rheumatology. Berney, who also is director of the UAMS rheumatology fellowship program, has more than 20 years of experience as a researcher and teacher, for which he has received numerous awards. Since joining UAMS in 2014, he has made it his goal to develop one of the premiere rheumatology training programs in the country. An endowed professorship is among the highest academic honors a university can bestow on a faculty member. A professorship is a $500,000 endowment established to support the educational, research and clinical activities of its holder, who will lead future innovations in medicine and health care. Those named to a professorship are among the most highly regarded scientists, physicians and professors in their fields of expertise. 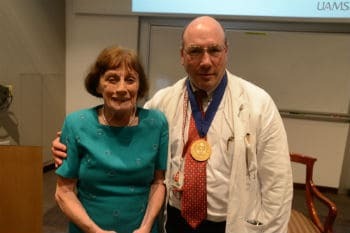 Eleanor Lipsmeyer, M.D., for whom the professorship is named, has a distinguished career as a physician and beloved faculty member and teacher. The newly established professorship honors Lipsmeyer, a physician and beloved faculty member and teacher in the Division of Rheumatology. Lipsmeyer received her medical degree from UAMS in 1962 and stayed for her residency in internal medicine. After completing her training at Yale University, she returned to UAMS in 1969, joining the faculty as assistant professor. Over the next five decades, she was promoted through the academic ranks, serving as professor until her retirement in 2015. Lipsmeyer earned high praise from patients, being recognized repeatedly as one of Arkansas’ best rheumatologists, and was voted one of America’s Best Doctors. UAMS College of Medicine seniors awarded her the distinguished and highly coveted Red Sash Award for excellence in teaching 18 times. Berney was presented with a commemorative medallion by Patterson and Westfall. He recognized Lipsmeyer, who was in attendance, and thanked those present. Under Berney, the fellowship training program has improved significantly, resulting in higher rheumatology in-service exam scores, and the Division of Rheumatology is increasing its research capabilities and attracting clinical therapeutic trials. Berney received his medical degree from Temple University School of Medicine and completed his postgraduate training at the University of Alabama at Birmingham and New York University. He joined the faculty at Louisiana State University Health Sciences Center-Shreveport in 1995 as assistant professor of medicine, and served successively as rheumatology fellowship director, internal medicine clerkship director, director of the student musculoskeletal “Core Concepts in the Clinical Sciences” course, chair of the institution’s promotion and tenure committee, chief of the Division of Rheumatology and director of the Center of Excellence for Arthritis and Rheumatology. Berney has served as a national council member and Southern Region president for the American Federation for Medical Research, rheumatology section editor for the Year Book of Medicine, rheumatology section lecturer for the MedStudy Internal Medicine Board Review Course, and a member of the American College of Rheumatology Research Awards & Grants Study Section B. He serves on the Alliance for Academic Internal Medicine education committee and faculty development subcommittee, and the American College of Rheumatology annual meeting committee. Berney has received numerous teaching awards, including the American College of Rheumatology Clinician Scholar Educator Award and the Dr. Allen A. Copping Award for Excellence in Teaching Clinical Science. At Louisiana State University Health Sciences Center-Shreveport, he received multiple Clarence H. Webb Awards for Outstanding Clinical Science Instructor, and several selections as the sophomore class Arnold P. Gold Foundation White Coat Ceremony Speaker and graduation marshal. He is a member of the Alpha Omega Alpha Medical Honor Society and has been named to the Best Doctors in America every year since 2005.